This slow recover particularly interests me at the moment as I recently did a little bit of work on the health risks associated with the hole at its peak for those living and working in Antarctica. This may become a more important problem in the future if further warming and ice sheet retreat make regions like the Antarctic Peninsula easier to inhabit, work in and/or exploit. Hopefully I’ll get to a bit more work on this soon. 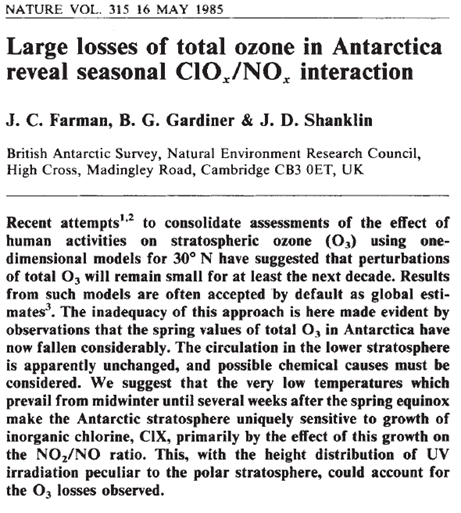 And I’ve always had a real soft spot for the paper as the ozone “hole” was the first time that I remember being aware of an environmental issue, despite being pretty young at the time (I was at primary school 30 years ago). I suspect that it played a large in shaping my view of the world and my career direction so I thought I should note the anniversary. So, Happy Birthday Farman et al. (1985)! If you want to get deeper into the ozone “hole” then Chapter 7 in Volume I of “Late Lessons from Early Warnings”, written by Joe Farman, is quite nice and the chapter in Merchants of Doubt is a good read on this as well. [Update, 15/5/2015 0937] There also a BBC “Costing the Earth” episode on the 30th anniversary of the ozone hole but I’ve not listened to it yet (thanks to @jimmcquaid on twitter for pointing me in that direction).